First, congratulations to your son! That's a great picture of the two of you. Second, I'm so sorry that this is still happening... Third, as usual, I'm in solidarity with you on this, Bill. There is a variant version of this disability gulag for people who use signed language interpreters as well. 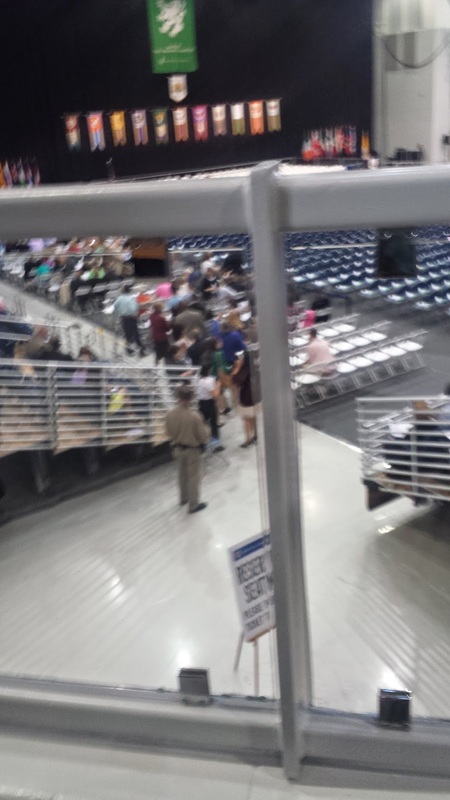 At my daughter's high school graduation (after the fight for interpreters, which involved hours of advocating and a threat to go to the press if interpreters were not provided at her graduation) I arrived and was told that I could not sit where the interpreter was most visible. I did as you did: I ignored their suggested seating, sat down, and didn't move. A teacher argued with me, and I refused to budge. I was told that in exchange for access, not one family member could sit near me (not even my daughter's father!) As the ceremony began, and I was surrounded by a sea of more than a dozen empty chairs -- enough for all of the family members who had come in from out of town for this special occasion -- my ex-husband slipped in to sit next to me so that I would not have to sit alone. I am so tired of separate seating, and so tired of having to make a decision between not marring a family member's day or standing up for my access rights. Three years after the fact I am finally able to write about this as the anger about has been slightly tempered by time, but the pain of not getting to bask in the day with all of my family members as my daughter had her big moment on stage remains. 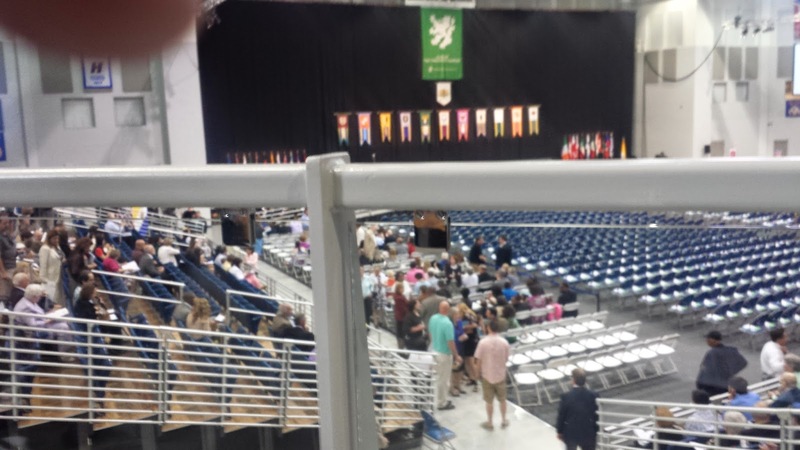 What I would have given to see my parents' smiles as she crossed that stage. I hope you and your son had a blast celebrating after the ceremony! I am very proud of my son. He is about to start his adult life and I look forward to watching him find his way in the world. I thought of you as the two giant screens in the sport complex were not captioned. However, I did see two interpreters on the main level where I sat. It was clear no thought had been put into access. 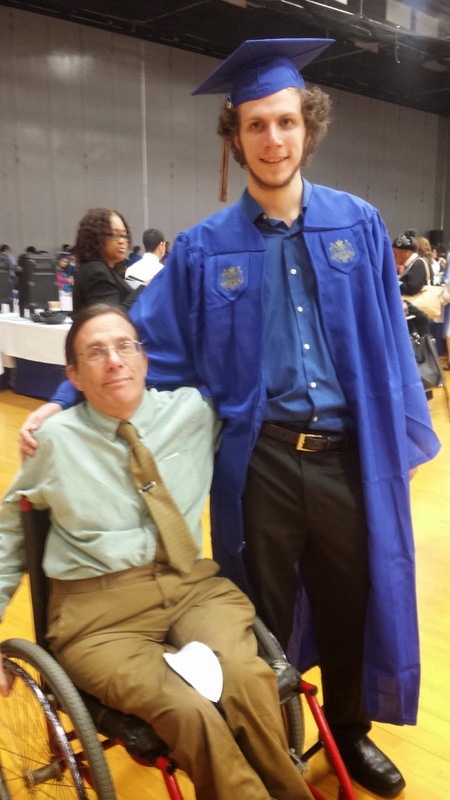 I wonder if Hofstra has washed its hands of disability access. That is they consider the issue resolved and no longer worthy of attention. These placements are so familiar. They are a constant irritant and chip away at one's sense of self, for sure. My husband and I have had similar experiences at large arenas across the country. Most recently it happened at the Bridgestone Arena in Nashville, where we went for a concert. We did not have reserved "special access" seating, as my husband didn't feel he needed it and didn't want to monopolize the space - inadequate as it is - for those who cannot use the steps that lead to most of the seats at arenas like this. 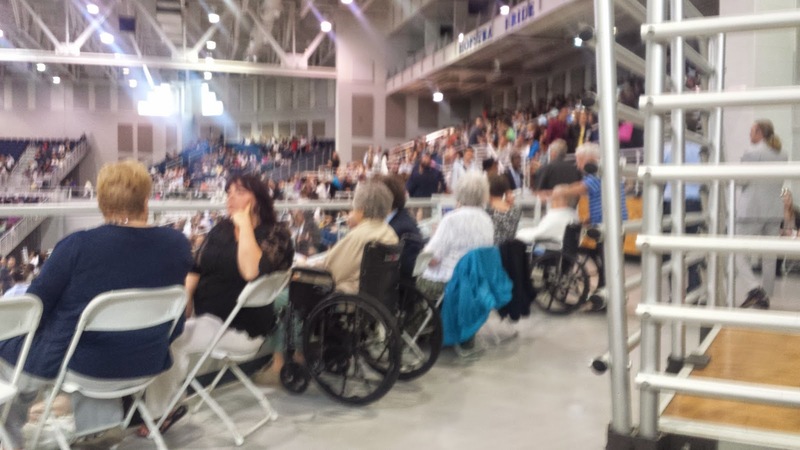 However, he did need someplace to put his walker once he climbed the steps to his seat. The event staff was, as always completely unhelpful. They claimed that they could not be held responsible for his walker, and offered no further suggestions for where we could put it. One even chided me (privately, of course - I am not visibly disabled and thus often treated as my husband's keeper) for not reserving a "special access" seat for him! Another actually tried to fold the walker and lean it against someone's wheelchair in the special access area. Appalled, I grabbed the walker and went on my own in search of a safe place for it. Of course, I found a guest relations office that was not only happy to hold it, but had a special area where they kept walkers, strollers, and other wheeled devices. How did the event staff not know of this area? Why did they not care? And why, as you ask, is the assumption that disabled people should sit separately built into the very architecture and institutional culture of these spaces? "Disability gulag" is the perfect term to describe it. Thank you, as always, for your insightful piece. And many, many congratulations on your son's graduation. Bill: Congrats to your son (great picture!) I'm sorry your day was marred because you had the 'audacity' to want to actually see your son receive his diploma like the other parents there. Thanks for continuing to call out these incidents whenever you encounter them. As a bipedal reader of your blog, I continue to be surprised by the extent of the separate-and-unequal landscape - although less and less with each passing day. Ronn, As previous commenters have noted handicapped seating is routinely bad. New buildings or old, I never know what to expect. This is a social problem and bipedal allies can only be helpful. So I tell people such as yourself if you see a person with a disability being poorly treated offer your support. This very rarely happens and always makes me feel good. Upon reading your post, I am reminded how often we as pwd's are often told to sit and stay, like pets. And when we dare to do otherwise, often we get the same treatment you did. Some version of "If you don't , well then we won't be held responsible if anything happens, because you broke The Rules and the rules say this is where you should be. ", happens every day. And it's codswollop in my opinion. Wouldn't those who are making it so difficult for you want to see their kid graduate without having a steel bar in their field of view? It never ceases to amaze me how the majority of people don't seem to understand why we would take issue with inaccessible spaces, or why we would dare take matters into our own hands to resolve the problem. I 'm positive if they were in our situation, they would look for a way to resolve the issue. So why are they so surprised and or upset when we do? I hope that you can champion some change at his former school for those who come after you and wish to watch their loved ones get their diplomas.